Our guests today were: MaryAnn Bawden, Blaine Ham Lake Rotarian Lyn Stepaniak and Twin Cities North Chamber President John Connelly. John noted that we are all invited to the T.C. North Chamber Open House on February 14th from 3-5PM at the Reserve, 1915 Highway 36 West in Roseville. The Chamber is also having its Golden Gala on Thursday March 7th, from 6-9PM. The event will be held at the Mermaid Event Center and tickets are $75. 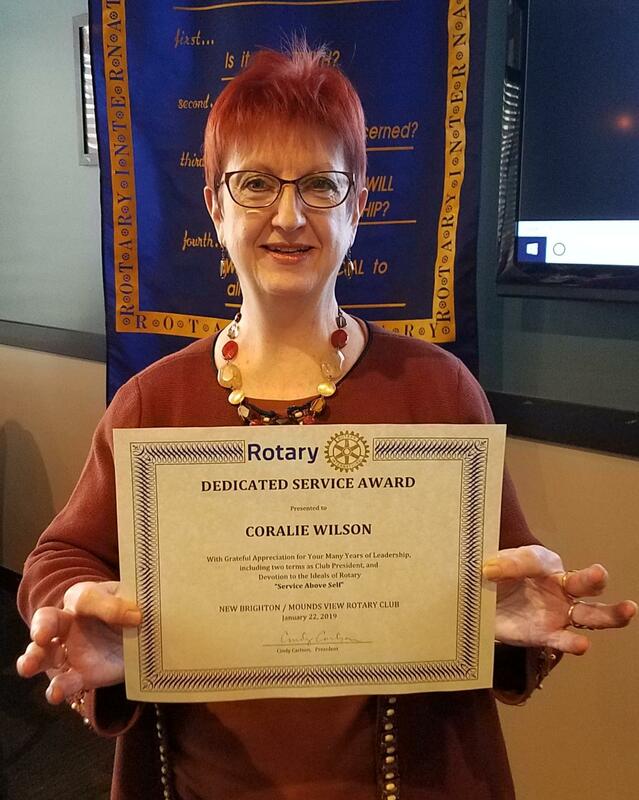 President Cindy Carlson presented Cor Wilson with a Dedicated Service Award, honoring her many years of service to Rotary and the community. Cor served as NBMV Rotary President twice, in 1997-98 and 2012-13. Cor was asked to join Rotary by Dana Rebelein, and Dana presented Cor with a “retirement clock” which had no hours on the dial, just the days of the week. Happy retirement Cor; we’re going to miss you. Cor is shown with her award, below. The club is gearing up to see if it can top last year’s stellar performance at the District Awards presentation. We’re looking for someone to help document this year’s progress. If you are that person, please contact Cindy Carlson. Our Exchange Student, Maria Klakegg, will be moving from the Johnson’s to her second home with the Jacobsen’s this Friday. Please think about including Maria in your activities around the cities…she is incredibly fun to be with. Don’t forget to get your RSVP’s for our 40th Anniversary Party to George Winiecki. Many past Rotarians will be joining us to celebrate this milestone. We’ll gather at the New Brighton Community Center from 5:30-9:30PM with catering by the Exchange. By now you all should have received your ticket selling information brochure for our 18th Annual Gold Plate Dinner on April 12th. Note that the ticket price this year is $150 per couple. To create some excitement about tickets sales, Mark Beisswenger has put together 4 teams that will compete for ticket selling honors (as well as prizes). The team captains are David Hoel, Garry Johnson, Nicole Ulrich and Michelle Caron. You can expect your team captain to contact you to plan your ticket selling strategy. The Board presented the revised by-laws for approval. The new by-laws were approved by voice vote. The St. Paul Sunrise, Minneapolis City of Lakes, and Roseville Rotary clubs are presenting a community forum entitled, “Minnesota’s Climate Future: Saving the Places We Love” on Thursday, May 2, 7:15-9:15, at the Town and Country Club in St. Paul. The forum will feature MPR Chief Meteorologist, Paul Huttner, Alan Anderson from the Northfield Rotary Climate Action Team and J. Drake Hamilton, Director of Science Policy for Fresh Energy. Cost is $25/person. 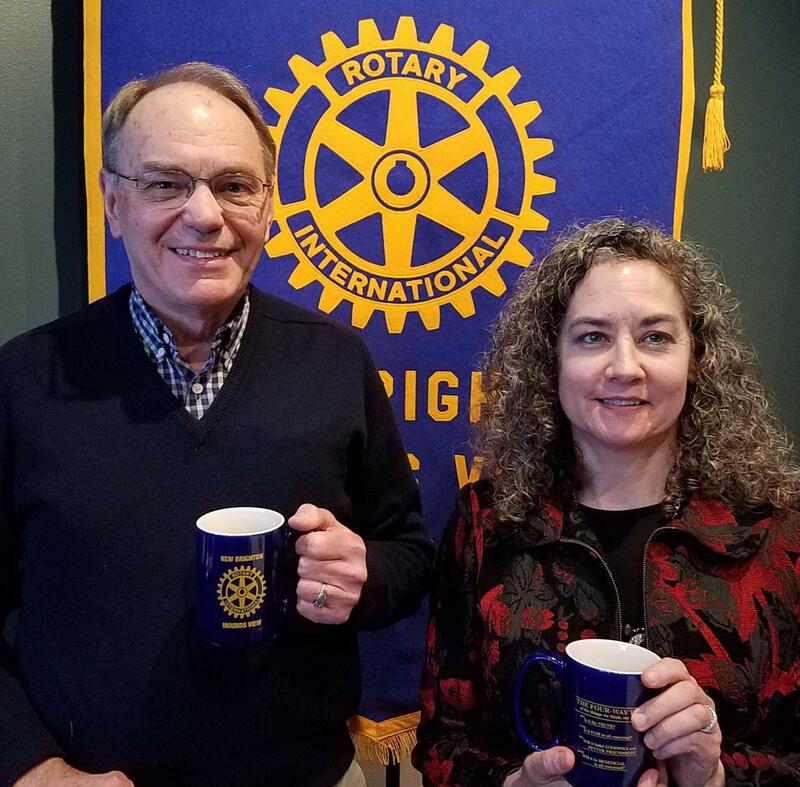 We were blessed with two speakers today, Bill Klump and Stephanie Cosgrove, both Rotarians from the Arden Hills/Shoreview club. Bill was here to make us aware of Arden Hills/Shoreview’s District Matching Grant Proposal to fund a sewing school for young women in the village of Amaravahti, India. The school would be modeled after a successful sewing school in Rajupalem, India, which was established by a non-profit organization called PUSHPA. PUSHPA was established by long-time Arden Hills residents Gummadi and Shirley Franklin to help underprivileged people in the state of Andhra Pradesh, India to participate in their own health, economic and educational development. The proposed school would serve young women and their families by teaching the women to sew. This basic skill would provide these young women with an opportunity for employment and perhaps entrepreneurship. Sewing skill would also make the women more marriageable by reducing the amount of any expected dowry. District 5960 has approved the $17,000 grant proposal and Arden Hills/Shoreview Rotary must now secure $4,800 in donations from area clubs. Bill is hoping that we will be able to help in that effort.